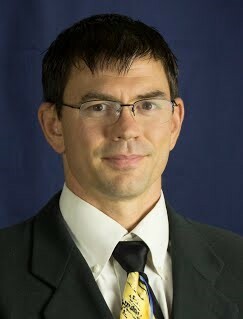 Ryan Ruddy is a senior lecturer in the Department of Economics at The Ohio State University. He joined the department in 2015 after earning his Ph.D. in economics at the University of Houston. Dr. Ruddy also earned a B.A. in mathematics at the University of Michigan- Flint and an M.A. in Economics from Miami University. Dr. Ruddy’s research interests include Applied Econometrics, Economics of Education, Sports Economics, and Labor Economics. Dr. Ruddy has taught seven different courses at Ohio State including principles of microeconomics (honors), intermediate microeconomics (calculus based), elementary econometrics, econometrics I, econometrics II, sports economics, and applied quantitative methods II (Ag Econ). During the 2018-2019 school year, Dr. Ruddy will teach two new courses offered for the first time at Ohio State: Sports Analytics and Economic Analysis; and Survey in Econometric Methods I.
Dr. Ruddy was nominated for the 2015-2016 Provost’s Award for Distinguished Teaching by a Lecturer at Ohio State. He has also served as a faculty mentor for the STEP program. Dr. Ruddy has interests in Sports and Society issues stemming from his background in coaching high school and youth sports.